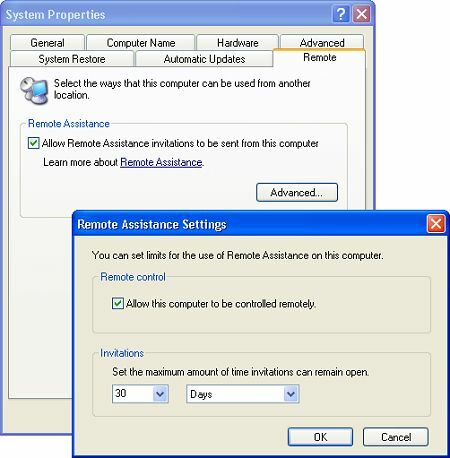 The Remote Assistance feature in Windows XP allows a support technician to connect to your computer over your local network or the Internet and see what you see on your computer screen and to use their keyboard and mouse to troubleshoot your computer. 1. Select Start | Settings | Control Panel. 2. In Control Panel open the System utility (in the Performance and Maintenance section). 3. In the System Properties dialog box, select the Remote tab. 4. Set the checkbox next to "Allow Remote Assistance invitations to be sent from this computer". 5. Click on the [Advanced...] button to open the Remote Assistance Settings dialog box. 6. In the Remote Assistance Settings dialog box, set the checkbox next to "Allow this computer to be controlled remotely" to allow the technician who connects to take control of your computer. Here you can also set the amount of time that you want to enable access to your computer. 7. In the Remote Assistance Settings dialog box, click on the [OK] button. In the In the System Properties dialog box, click on the [Apply] button, then click on the [OK] button. Now that your system is configured to accept Remote Assistance, you'll need to contact a support technician, usually by email, to provide that assistance. Both you and the technician must be connected to the Internet and running Windows Messenger. In Windows Messenger, contact the technician and then select Tools | Ask for Remote Assistance Service.